The MX-500 has received unanimous praise from Time magazine, The New York Times, The Wall Street Journal and dozens of other publications. The leading online source of information and reviews on remote controls, RemoteCentral.com said, 2The MX-500 is the finest hard button remote we’ve had the pleasure of using.” But the reviews only tell part of the story, the real pleasure comes from using an MX-500 with your own system, every day! 15 macro buttons of 20 steps each and 50 favourite channel macro buttons of 10 steps each Clone programming from one MX-500 to another MX-500 in less than 3 minutes Bright backlighting for both the LCD screen and buttons True one-hand ergonomic operation. The MX-650 controls up to 20 components. 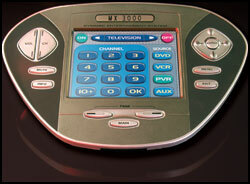 Each of the 20 components can be programmed with up to 4 pages of LCD screens, plus the 33 hard buttons. The MX-650 allows you to edit the text on each LCD screen exactly as you prefer (up to 26 screens with 10 buttons per screen, for a total of 260 available text buttons and up to 5 characters per button). The powerful memory of the MX-650 offers up to 912 potential Macro buttons. Each of these macros can play back up to 190 steps with one touch. For example: a single touch to the ON button could turn on the TV, the surround sound system, and the satellite receiver, then set the TV to the correct video input, the surround system to the right audio settings, and finish by selecting your favorite satellite TV channel. The MX-650 allows the user to program up to 50 favorite channels and the 5 LCD screen will display the favorite channels that are programmed. This allows the users to access their favorite channel with one simple button press. The optimized layout of hard buttons enables you to naturally reach both 5-way thumbpad to navigate on-screen menus and the critical Transport, Channel and Volume buttons. You'll quickly discover that you prefer using the MX-650 to control all the special features of your system (especially digital video recorders, satellite receivers, DVD players, surround sound receivers and digital cable boxes). There will never be a reason to dig out your old factory remotes again. The MX-650 system features a smart memory back-up system that will retain the programmed memory for up to ten years, even with dead batteries. The new center select button is now detached form the joystick to offer more accurate response to button presses. The Laser etched buttons have a look and feel that instantly appeals to the customer. These Laser Etched buttons add a very distinguished look and extended durability to the remote controls that will compliment any high-end system. IR (line of sight) - Up to 60 feet with fresh batteries. The MX-3000 Dynamic Entertainment System is our most sophisticated whole house remote control. It provides the custom installer and customer with an extraordinary entertainment control solution. • Unparalleled macro capability – IR commands, variables to change button text and graphics, even multiple page jumps during a macro! • Built in templates enable you to select all new button art, rather than changing one button at a time.